Amaze your friends at the push of a button! Imagine watching your friend's amazement when they see your new Magic Motion Clock.Come one, come all to this Gala...a spectacle at the push of a button or on the top of the hour. 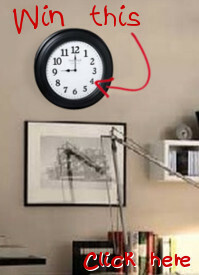 Either way, you will see this clock put on a show when the dial rotates down and unveils 3 more Magic Motion driven elements that rotate to one of 30 melodies. The clock is framed with a burl wood look for a classy look. A rotating Swarovski crystals pendulum wheel at the bottom rotates continuously to add more color to the already fun-filled Gala.